Mosul’s collapse is Nouri al-Maliki’s fault: Iraq’s prime minister failed to rule inclusively. If jihadists control Iraq, blame Nouri al-Maliki, not the United States. Civilian children stand next to a burnt vehicle during clashes between Iraqi security forces and the Islamic State of Iraq and Syria, or ISIS, in the northern Iraqi city of Mosul, on June 10, 2014. The collapse of Mosul, Iraq’s second-largest city, has little to do with the withdrawal of American troops and everything to do with the political failure of Prime Minister Nouri al-Maliki. As the U.S. pullout began under the terms of a treaty signed in 2008 by then-President George W. Bush, Maliki, the leader of a Shiite political party, promised to run a more inclusive government—to bring more Sunnis into the ministries, to bring more Sunnis from the Sons of Iraq militia into the national army, to settle property disputes in Kirkuk, to negotiate a formula on sharing oil revenue with Sunni districts, and much more. Maliki has since backpedaled on all of these commitments and has pursued policies designed to strengthen Shiites and marginalize Sunnis. That has led to the resurgence of sectarian violence in the past few years. The Sunnis, finding themselves excluded from the political process, have taken up arms as the route to power. In the process, they have formed alliances with Sunni jihadist groups—such as the Islamic State of Iraq and Syria, or ISIS, which has seized not just Mosul but much of northern Iraq—on the principle that the enemy of their enemy is their friend. The fall of Mosul is particularly poignant because that was the city where peace and prosperity seemed most likely in the early days of the American occupation. David Petraeus, then the three-star general who commanded the 101st Airborne Division, applied his theory of counterinsurgency to all of Nineveh province, of which Mosul was the capital. And, for a while anyway, it worked. While most U.S. commanders in post-Hussein Iraq were ordering their soldiers to bust down doors and arrest or shoot all men who seemed to be insurgents, Petraeus and his team took steps to create a government. Using funds pilfered from Saddam Hussein’s coffers, they vetted candidates for a citywide election (selecting leaders from all factions and tribes), started up newspapers and TV stations, coordinated fuel shipments from Turkey, and reopened businesses, communication lines, and the university. This game plan was classic “nation-building,” a phrase anathema to most Army generals and the secretary of defense at the time, Donald Rumsfeld. The idea was not to make the people of Mosul love America, but rather to make them feel invested in the future of the new Iraq. Petraeus’ campaign wasn’t entirely about civil affairs. Mosul was home to many of Hussein’s top officers and, in the wake of his downfall, a hotbed of emerging Sunni militias, who would wage a war of resistance against both the Shiite government and the American occupiers. Petraeus made remarkable progress in turning Mosul around, but toward the end of his yearlong tour of duty, protesters began to riot, Petraeus responded by setting up a counterterrorist operation, and the conflict turned more violent. Then he and 101st Airborne (along with all 120,000 of the American troops who’d taken part in the invasion) were ordered home. In Mosul, his division was replaced by a single brigade, with one-third the number of troops and a commander who had no interest in what Petraeus had been doing and instead reverted to what most commanders were doing—raiding, arresting, and shooting men that they thought might be bad guys—thus fueling the insurgency. But here’s the point: To the extent that these campaigns worked, it wasn’t just because of the military presence. It was, more, because specific commanders understood that war, as Clausewitz famously wrote, is “politics by other means,” and that in post-Hussein Iraq this meant setting up structures of local government that included (or co-opted) all factions and tribes willing to reconcile with the new order. One problem always was, and still is, that Maliki had no interest in conciliatory politics on a national level. And that’s why he’s now facing a monumental, even terrifying armed insurgency. His troops in Nineveh province simply folded when they came under attack, not because they weren’t equipped or trained to fight back but because, in many cases, they felt no allegiance to Maliki’s government; they had no desire to risk their lives for the sake of its survival. Meanwhile, the ISIS commanders have picked up the hundreds of weapons and dozens of vehicles that Maliki’s army has left behind. They’ve also looted the banks and taken over communication centers. Some of them have returned to Syria to resupply their comrades fighting there. (The ultimate goal of ISIS, as its name suggests, is to create an Islamic state in Iraq and Syria.) Others have used the resources to march southward. These jihadists are very competent fighters. They reportedly seized Tikrit (Saddam Hussein’s hometown) from the north, east, and west. Maliki has rallied his remaining troops to Taji, just north of Baghdad, to prevent or deter an assault on the capital. Some U.S. officials are optimistic that he’ll succeed. Given the ongoing fighting in Syria, ISIS might not want to waste its soldiers and ammunition on a protracted battle in Iraq. (Its triumphs so far have been, by and large, uncontested.) Still, no one claims much confidence in this prediction. In any case, unless Maliki can rally a counteroffensive, the northern half of Iraq seems to have been ceded to Islamists. 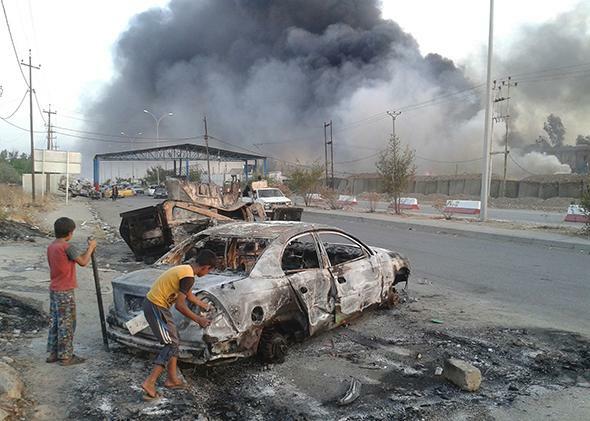 One hope for Iraq is that ISIS might have gone one rampage too far. While stomping through Mosul, some of their militiamen stormed the Turkish consulate and kidnapped Turkish diplomats. Under international law, that amounts to an attack on Turkey, and it’s unlikely that the Turks will simply shrug. Iran, which has emerged as Maliki’s main ally, has no interest in seeing Sunnis—much less millenarian Sunnis—regain power in Baghdad. A strange alliance among all three may come to life to beat back this equally strange insurgency. In one sense, this is a hopeful sign. The countries in the region have to form indigenous alliances to stave off these radical threats. The United States can help, but there is no way any American politician is sending back tens of thousands or hundreds of thousands of troops: They didn’t compel or convince Maliki to adopt a smart policy before, and they wouldn’t be able to do so now. But this could be yet another sign of a breakdown in the entire Middle East. The war in Syria, which can be seen as a proxy war between the region’s Sunnis and Shiites, is now expanding into Iraq. The violence will intensify, and the neighboring countries will be flooded with refugees (half a million have already fled Mosul), with few resources to house or feed them. Depending on what happens in the next few weeks, or maybe even days, we may be witnessing the beginning of either a new political order in the region or a drastic surge in the geostrategic swamp and humanitarian disaster that have all too palpably come to define it. Correction, June 11, 2014: This post originally misidentified Abu Musab al-Zarqawi, the former leader of al-Qaida in Iraq, as Ayman al-Zawahiri, the current leader of al-Qaida.